“And we’re back” says Mira Grant in her acknowledgments, as the bestselling author returns to her Newsflesh world after a trilogy and collection of novellas. Events essentially reset as we jump back in time to the beginning of Feed with the presidential race beginning in a world where zombies are at the forefront of everyone’s minds. While the main characters from the aforementioned book are joining the campaign of the Republican nominee, our new diverse group of characters find themselves being tapped to join one of the Democratic potential nominees and cover her run for president. The story is told from the point of view of the Irwin Aislinn “Ash” North, who is Irish but now a recent citizen after having married Benjamin Ross for pure green card purposes and getting herself out of her native country for some very specific reasons. Then there is Audrey, the fictional, who is Ash’s girlfriend. Finally, there’s Mat, the requisite techie, who is gender-fluid. Readers are no doubt excited to hear about a new Newsflesh novel, but hopes will be somewhat dashed when they learn it is a very similar story to Feed about a news team covering a presidential race with lots of zombie attacks thrown in for action. There are some new details and facts added about the world that open things up a little, but after the astounding ride around the world that was Rise: The Complete Newsflesh Collection, Feedback is pretty much a disappointment in most areas. Originally written on October 31, 2016 ©Alex C. Telander. If you’re a reader and a fan of the horror genre, then chances are you’ve read a zombie book of some sort; maybe more than one. In case you haven’t noticed, this living dead sub-genre simply won’t go away, as more and more zombie books are being churned out, to the point where most horror authors have now tried their writing hands at bringing an unlikely character back from the dead. In an earlier Book Banter Column I discussed the short history of the zombie genre, which you can read here. The big problem I find with most zombie books is that that’s all the story is really about: zombies attacking humanity and how humanity fights back, kills them for good, and ends up winning. End of story. This is fine as a story premise, except that it’s been done so many times, not just in books, but in movies, comic books, as well as various other forms of media. For me the unique zombie story is one that has an interesting, captivating story in a world where there are zombies. Mira Grant is the pseudonym of Seanan McGuire. Seven years ago she came up with an idea for a zombie book that was a small idea that became a big one, then a trilogy. The first book, Feed, was released in 2010 and was nominated for a Hugo Award. The second book, Deadline, was released in 2011 and received just as much support and good press as its predecessor. The final book in the trilogy, Blackout, was released just this week and has already been getting lots of coverage and hurrahs from fans. So the complete trilogy has been released, and it honestly feels more like one long book, making it the perfect time to check this series out and give it a read. It is the future, the year is 2039. Twenty-five years ago the Kellis-Amberlee virus was released and began turning humanity into zombies. The world is now a very different place: many people rarely leave their homes, or the protected confines of their neighborhoods; many places have been overridden by zombies, while the government does what it can to feebly protect its people. Georgia Mason (named after someone who understood zombies very well) and her twin brother Shaun are bloggers. When everything went to hell a quarter-century ago, the media denied what was happening, mocking the bloggers who were purportedly telling the truth. Now the bloggers have become the media, for they are the only ones brave (or stupid) enough to get close to the zombies and report what’s happening. It’s an election year and Republican Senator Peter Ryman is running for president, looking to change the country, to make the American people feel safe and protected once more. George and Shaun and their techie Buffy have been picked as members of the media to cover Senator Ryman’s campaign, launching them into journalism stardom. But then something terrible happens, at one of the Senator’s events; zombies attack and people die. As the Senator’s campaign continues, George, Shaun and Buffy try to put the pieces together and work out exactly what’s going on, and why the Senator is being attacked, in an attempt to ultimately find out who is behind it all. Mira Grant is not simply telling a good story about zombies; she is instead telling a fantastic story about a group of young bloggers covering the campaign of a hopeful presidential candidate in a world where there are zombies and fear is a part of everyone’s everyday life. And as the book comes to a close, the reader realizes there are things in this world that are worse than zombies. Shaun Mason is in a very dark place. In a world where every person wakes up with the fear of zombies in their minds, as well as the terror of somehow amplifying at any moment, Shaun doesn’t really care anymore. When he had to shoot his sister and kill her before she fully amplified, it was definitely a turning point in his life. And now he has very little to live for; his sister was everything to him, and had always joked about what she would do when he was dead, because he was the risk taker. There was no scenario for when George was killed and Shaun was left all alone. Though there is one little light in this dark, dark tunnel and that is that Shaun still talks to his sister . . . in his head. She’s alive and well in his brain and he talks to her, has conversations with her, even argues with her. Fortunately, anyone else who spends time with him knows that Shaun is now pretty much crazy and they all just deal with it. But the world must go on and Shaun has a news organization to run, along with an experienced team, he makes the decisions when he has to and lets the talented people he has working for him do what they do best; while the former daredevil who used to fly in the face of danger for the chance to get some great zombie footage is no more. And then a member from the CDC drops into their laps with an incredible story to tell. A story that has everything to do with the Kellis-Amberlee virus, how it might have got started, and where the CDC is on the cure. She’s also faked her own death and appears to be off the radar, and then a devastating outbreak coincidentally happens right where Shaun and his team are currently hanging out. Some make it out, while others are incinerated, as outbreak protocols are followed. This event awakens the spark and drive that has been missing in Shaun for some time. Now he has something to go on, a clue that will lead him on the trail to finding out who had his sister killed and how this virus got “accidentally” released and destroyed the world. We last left George apparently somehow alive and well, living the life of a clone in a CDC lab. She slowly puts things together as time passes, but for every answer there are fifty more questions. Also is she really Georgia Mason? She doesn’t have the reservoir condition anymore; she’s a lot thinner that George ever was; and her hair is annoyingly long and bleaching with every shower. Then she finds out she might have an ally or two on the inside, but she isn’t sure if she can trust them. Meanwhile, as Shaun continues to talk to Georgia in his head and act all kinds of crazy, he keeps the gang of After the End Times on the move. After spending some time with Dr. Abbey in her secret lab, as she takes copious daily amounts of his virus-immune blood, he thinks about where the trail is leading next, where he can get more answers, and find out just what this whole conspiracy is all about. It will involve possibly going on a rescue mission to Florida, which has been designated a zombie-ridden loss for the country; meeting with his parents who he hates, to ask for help; and tracking down the best I.D. counterfeiter in the business to start their new lives. Mira Grant skillfully switches between the George and Shaun storylines with each chapter, making the characters appear as distinct and complex as they were in the first two books, as she slowly but seamlessly brings them together, building the tension and thrill. The reader knows the step-siblings are going to meet up again at some point, but will Shaun be able keep his sanity or will he just be pushed over the edge? Then there’s the question of which clone of Georgia Mason will be there to greet him? 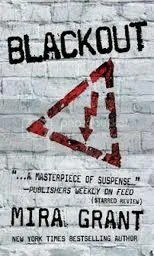 Blackout is the perfect, satiating finish to the trilogy, making the three-book series feel like one long, epic story. No reader will be disappointed, with a worthwhile ending that will leave him or her sad that the wonderful journey is now over . . . but just like when the end of Harry Potter was reached, or the final page of Stephen King’s Dark Tower series, how many of us turned back to the first book and started reading that first page once again. Having reread the first two books, this trilogy will be one I will continue to reread constantly throughout my lifetime. Mira Grant is the author of the popular and bestselling Newsflesh zombie trilogy consisting of Feed, Deadline, and Blackout. The stories in When Will You Rise: Stories to End the World were originally published on Grant’s blog leading up to the release of Deadline in 2011, with a new story posted each day. They are now collected in their entirety in When Will You Rise from Subterranean Press. 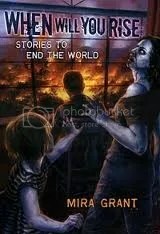 Anyone who has read the trilogy is familiar with the state of the world after the zombie uprising and how the main characters, Georgia and Shaun, lived through it and continued to survive. Readers have had hints here and there and some explanation of the past and when the uprising began in the summer of 2014. When Will You Rise tells those stories, of Shaun and Georgia’s parents, of the scientists working on a cure for the common cold, and those working on a cure for cancer and how the two ended up comingling in the atmosphere to turn everyone into ticking zombie time bombs: once you die you come back a zombie hungry for human flesh. When Will You Rise is an excellent compendium to the trilogy, filling in gaps and histories that the original three books all but gloss over. Fans of the series will not be disappointed, and for those wanting a small taste of what the series has to offer, to whet their appetite, When Will You Rise is a perfect start. Originally written on September 25, 2012 ©Alex C. Telander. To purchase a copy of When Will You Rise from Amazon, and help support BookBanter, click HERE. It’s been three years of great writing from Mira Grant, with Feed in 2010, Deadline in 2011, and now in 2012 with the release today of the final book in the trilogy, Blackout. For those of you who’ve been reading along, you’ll be no doubt zombie-hungry to start reading this last installment, and for anyone who hasn’t tried these fantastic books yet, they’re some of my all time favorites. Below are my reviews to the first two books, as well as interview links. The great people at Orbit books have made this funny, interesting, scary, and captivating book trailer for the Newsflesh Trilogy. If you haven’t read the books, you should check it out; if you have read the books, you should check it out; if you got here by accident, you should check it out . . .
Also if you’re in the San Francisco area on Saturday at about 5PM, you should come on down to Borderlands and meet the brilliant mind behind Feed and Deadline, the great Mira Grant herself. Details about the event can be found here. To enter the BookBanter giveaway for a SIGNED COPY of Deadline, go here. Mira Grant is the pseudonym of New York Times bestselling author Seanan McGuire. She is the author of the Newsflesh Trilogy, the first two books of which have been released, with Feed and Deadline. 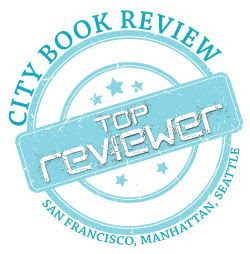 Seanan McGuire was first interviewed on BookBanter on September 1st, 2009; you can listen to it here. Mira Grant was first interviewed on BookBanter in April of 2010; you can read the interview here . In the interview, Grant talks about how she goes about doing research, how she and Seanan McGuire get along, what else McGuire is working on, and some very important final words. You can read the interview here. It’s June 1st and time for another BookBanter Boon and a new book giveaway, and this one’s a pretty cool and special one. To tie in with the release of Deadline by Mira Grant, the sequel to Feed, as well as the new interview with her up on BookBanter, I will be giving away to one lucky winner A SIGNED COPY OF DEADLINE! Anyone in the US can enter. To enter simply leave a comment on this post. The question for you for this BookBanter Boon is where will you be hiding out (reading Deadline, of course) when the rising happens? Entries will be accepted from June 1st until 11:59 PM Pacific Standard Time on June 14th. The winner will be randomly chosen, contacted, and announced on this post on June 15th. If you have any questions, please email me at alex@bookbanter.net.